The biggest feature the Tunturi J4F treadmill boasts is its heart rate controlled workouts. But with its recent $200 price increase, it made people think twice if this treadmill is still worth buying. If working out in your target heart rate zone is your main objective then, this treadmill might be the one you’re looking for. It offers you plenty of heart rate controlled workouts to choose from. But before buy this treadmill, I suggest you read the whole review first. It might make you change your mind. Just like the cheaper Tunturi J3.5F treadmill, this one also comes with a 2.0HP continuous duty motor that can reach speeds of up to 10mph and elevations of up to 10%. This treadmill boasts some great workout programs. It has 8 intensity/time scaleable pre-set profiles which increases your workout intensity by 5% every 5 minutes. It aslo offers 4 preset heart rate control profiles and 4 preset speed / elevation training programs. With all these workout programs, it’s a shame most people won’t be able to use it comfortably. The Tunturi J4F treadmill only has a small 17” x 51” tread belt. The console shows you your graphic profile display, scrolling information bar, time, distance, speed, energy consumption, elevation, and heart rate so you’ll always know the information most important to you. Tunturi needs to do something about this model's below average quality. Also, they could make the tread belt bigger so more people can enjoy their training programs. I wouldn’t recommend the Tunturi J4F treadmill. I believe that their tread belt is too small for people to really be comfortable using it. And, the fact that it just had a price increase and that its quality is below average made me more hesitant to recommend this machine. If you really want a high quality mid-priced treadmill, I suggest you check out the Sole S77 Treadmill. 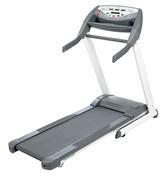 It is currently our best buy treadmill below $2,000. If you plan on buying a Tunturi J4F treadmill, I suggest you buy it at Amazon.com. They offer the cheapest price around the net. You can get it for just $1,599.99.